I often find myself needing a knot to bind something. Sometimes it's to bundle a bunch of items together, other times it's to keep something from falling apart. 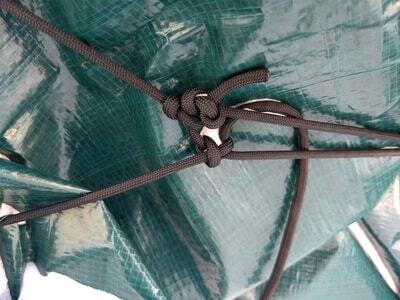 Most of the time, my solution looks like this: A bunch of overhand knots or square knots on top of each other. Shamefully, I fall into the habit of "Don't know the knot? Tie a lot!" This doesn't really accomplish the goal. Instead of a simple knot that does its job well, I have a knot that's impossible to untie and won't stay tight. 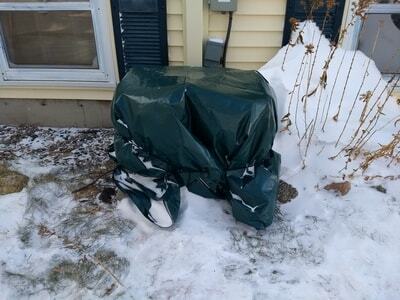 In the north, we have to cover our air conditioner units with a cover so that they don't rust out after they get buried in snow. Being a responsible home owner, I bought the cheapest AC cover. It was way too big for my unit, and it blew away the first time the wind came up. I knew a snowstorm was on its way, so I tied a tarp around the AC unit using paracord. It gave me an opportunity to try out my new knot knowledge. Disclaimer: The image below is a horrible example of a correctly tied butcher's knot. 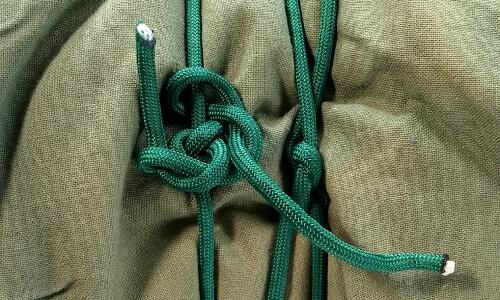 If tied correctly, it will not look like this! Take a look at the title image instead. My butcher knots look pretty messy, but I was doing it from memory and I could barely feel my fingers. Needs some practice, but the AC cover stayed on through two blizzards in December. I'm going to call that a success. What do you think? Does this do a good job of being the "go-to" knot for simple household binding? Maybe you know of a better one. Let me know in the comments.